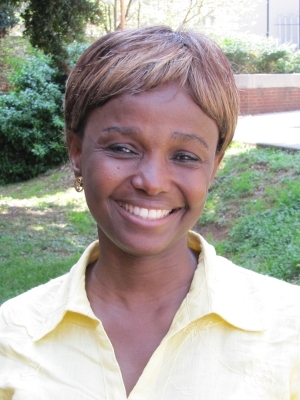 As a NIMBioS postdoctoral fellow, Folashade Agusto (Ph.D. Mathematical Sciences, University of Ilorin, Nigeria, 2008) conducted research involving mathematical analysis and optimal control of transmission dynamics of infectious diseases with focus on bovine tuberculosis, malaria and avian influenza. Upon completing her fellowship at NIMBioS, Dr. Agusto accepted a position as assistant professor of mathematics at Austin Peay State University. Gaoue OG, Jiang J, Ding W, Agusto FB, Lenhart S. 2015. Optimal harvesting strategies for timber and non-timber forest products in tropical ecosystems. Theoretical Ecology. Agusto FB, Del Valle SY, Blayneh KW, Ngonghala CN, Goncalves MJ, Li N, Zhao R, Gong H. 2013. The impact of bed-net use on malaria prevalence. Journal of Theoretical Biology, 320: 58-65. [Online]. Agusto FB, Gumel AB. 2013. Qualitative dynamics of lowly- and highly-pathogenic avian influenza strains. Mathematical Biosciences, 243(2): 147-162. [Online]. Agusto FB, Marcus N, Okosun KO. 2012. Application of optimal control to the epidemiology of malaria. Electronic Journal of Differential Equations, vol. 2012(2012, no. 81): 1-22. [Online]. Agusto FB, Bewick S, Parshad RD. 2012. Mosquito management in the face of natural selection. Mathematical Biosciences, 239(1): 154-168. [Online]. Agusto FB, Okosun KO. 2010. Optimal seasonal biocontrol for Eichhornia Crassipes. International Journal of Biomathematics. 3(3):1-15. [Online]. Concurrent with Agusto's postdoctoral appointment, Agusto was co-organizer for the NIMBioS Investigative Workshop: Malaria Modeling and Control, June 2011. Agusto also participated in the NIMBioS Tutorial: Stochastic Modeling in Biology; the 2009 and 2010 Undergraduate Research Conference at the Interface of Biology and Mathematics; the NIMBioS Tutorial: Graph Theory and Biological Networks; the NIMBioS-BioQUEST-SCALE-IT: Computational Biology Curriculum Development Tutorial; the NIMBioS Investigative Workshop: Modeling Toxoplasma gondii; the NIMBioS Investigative Workshop: Optimal Control and Optimization for Individual-based and Agent-based Models; and the NIMBioS Tutorial: Optimal Control and Optimization for Biologists. Agusto also gave a NIMBioS Interdisciplinary Seminar talk, "Optimal control of the spread of malaria super-infectivity." Agusto was an invited participant in the MBI Workshop for Young Researchers in Mathematical Biology in 2010 and gave invited talks at Maryville College, Maryville, Tennessee and at Fisk University, Nashville, Tennessee. Agusto also mentored students in NIMBioS' Research Experiences for Undergraduates program. Agusto mentored and assisted short-term visitor Eti Dwi Wiraningsih with her research and visit. Agusto attended two workshops -- "How Can You Tell if the Light Goes on? Designing a Classroom Assessment Strategy and "How to Mentor and Advise Ph.D. Students" -- at the University of Tennessee's Teaching and Learning Center. She participated in the NIMBioS Tutorial: Stochastic Modeling in Biology, the NIMBioS Tutorial: Optimal Control and Optimization for Biologists, the NIMBioS Tutorial: Graph Theory and Biological Networks; the MBI Workshop: Ecology and Control of Invasive Species, Including Insects and the Mathematical Association of America (MAA), South Section Short Course: Teaching Differential Equations Inquiry-Style.